The pay-what-you-want IndieGameStand is now open for business. The IndieGameStand, which we first drew your attention to a couple weeks ago, is now live and ready to take your money - however much (or little) of it you want to part with. IGS takes the "pay-what-you-want" concept popularized by indie game bundles and puts it to work full time, with rolling offers for individual games at just about any price you'd care to pay. IndieGameStand's launch title is the clever Escape Goat, a puzzle platformer that follows the adventures of a goat imprisoned for practicing witchcraft, his little hat-wearing mouse buddy and the sleeping sheep they must awaken in order to escape. It's a weird premise but a lot of fun to play, and wickedly challenging at the higher levels. 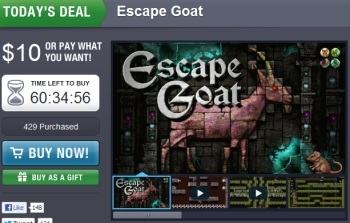 Escape Goat comes with a $10 suggested price, but you can go almost as low as you want - there's a 25-cent minimum, which is still stupidly cheap. Paying at least $1 earns a key to unlock the game on Desura, beating the average purchase price (currently at $1.80) gets the original Escape Goat soundtrack, the "Guest Remix Album" and four new player-created worlds, and paying at least $10 will net you a free copy of Brilliant Blue-G's platformer Chester, which IGS was giving away to anyone who signed up for the service before launch, as well as a free copy of whatever game comes next, plus bonus content for all three titles. Ten percent of all funds raised will go to the American Red Cross, the charity that Escape Goat developer MagicalTimeBean has chosen to support during its run on the site. So it's a good game, a good cause, a good price, DRM-free and best of all, if this one doesn't float your boat, just wait a few days: A new game goes up for sale every 96 hours.